BLOCKHEAD Vitamin Gum, a new, fun and convenient way to get your daily vitamins. With 100% of your daily dose of vitamins A, B, C & D in just two pieces – your body is getting a shot of essential nutrients, quickly and efficiently. Cold-pressed: all ingredients are combined cold, so nutrients aren’t reduced or damaged by heat and moisture. Hands-free and liquid-free vitamin gum: comes in a resealable pouch for ultimate convenience and portability. Chew Blockhead Gum for 5 minutes. sweeteners: sucralose, acesulfame K; coating agents: gum arabic, talc, carnauba wax, colors: E171, E120. Food supplement in chewing gum form with Vitamins A, C, B6 and D.
should not be exceeded. Keep out of reach of children under the age of three. The product contains polyols therefore an excessive consumption may cause a laxative effect. 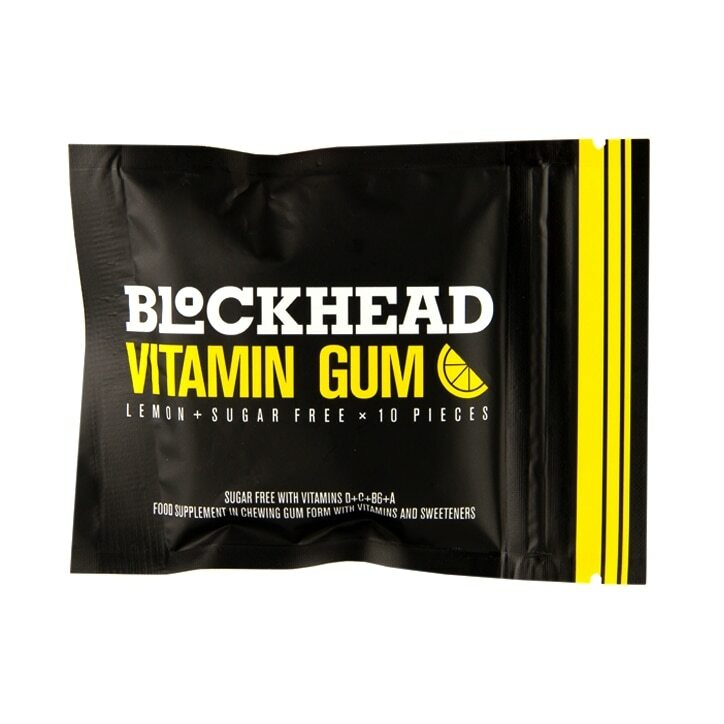 Blockhead Vitamin Gum Lemon is rated 5.0 out of 5 by 1. Rated 5 out of 5 by jazzhandz from Tasty gum Bought this gum because I was intrigued by the product and have never seen a vitamin gum before. I was pleasantly surprised, especially by the taste - was very fruity and 'lemony'.